So, this post is all about first house related things. Things which are represented by first house. 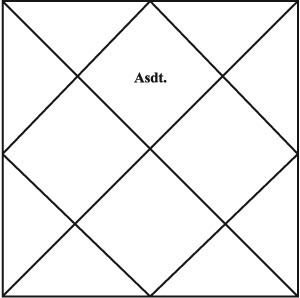 Again, as I told in previous post, first house of horoscope is where you find Asdt. written in this picture. Asdt. means Ascendant, so it is also called Ascendant house. As it represents the east direction of sky and Sun rises from east, it is also called Rising House or Rising Sign. In many astrological software it is denoted as Asc. 3. Overall body and specially head in human body. 8. Basic foundation of kind of life we are going to live. Now, every house has at least 1 planet as its Karaka or significator or indicator. Result of that particular house depends significantly on the position of that planet along with the other planetary positions. Karaka/Significator of the first house is Sun. And I am going to repeat this through out that never think of your or anyone's horoscope as good or bad just because of 1 planet's placement. There are in total 12 houses, 12 zodiac signs, 9 active planets as per Vedic Astrology and 27 Nakshatras (each nakshatra having 4 pada). So fortunately, Astrology is deeper than just the Sun Sign or Moon Sign predictions. @ Virendra - it will be challenging. please read my recent fb post on Rahu-Saturn conj. Impact of Sani and Rahu in 9th house for Dhanu Lagna. In Sani Mahadasa..will it be positive ? @ koul it shows dearth of money in early life. limited association of family and wealth thru self efforts. Impacts of the combination of Sani and Rahu in 2nd houseMaker for Danu Lagan.